This entry was posted on Tuesday, October 14th, 2014 at 10:07 pm	and tagged with Aaron Burr, Alan Simpson, Alexander Hamilton, Benedict Arnold, Benjamin Franklin, Benjamin Franklin Bache, Bob Beauprez, Charles Percy, Cory Gardner, DirecTV, Erskine Bowles, George Washington, Henry Jackson, James Madison, John Adams, John Hickenlooper, Jon Meacham, LinkedIn, Mark Udall, Nickelback, Patrick Henry, Philip Mazzei, Ron Chernow, Samuel Adams, Thomas Jefferson, Walter Isaacson, Wheat Thins and posted in American history. You can follow any responses to this entry through the RSS 2.0 feed. What an excellent article, Dave. You are a talented writer. Good to see you writing again – even if it is about politics. 🙂 Thanks Dave. history, sports, and politics? nice. What today’s politicians seem to lack is the inherent backbone to spout anything but the lyrics to their parties hit songs. They don’t even know the words to anything else nor do they recognize the lack. Everything is black and white, grey is the new invisible. Perhaps the moderates from both parties, surely there are some, have been drowned out by the cacophony of the digital age. I have recently been watching episodes of The Newsroom and longing for the days of reasoned discourse from anyone, anyone at all. Thanks for being a voice in the wilderness, Dave. Your article was forwarded to me out here in Orange County, California by my son, a fan in Boulder, Colorado. 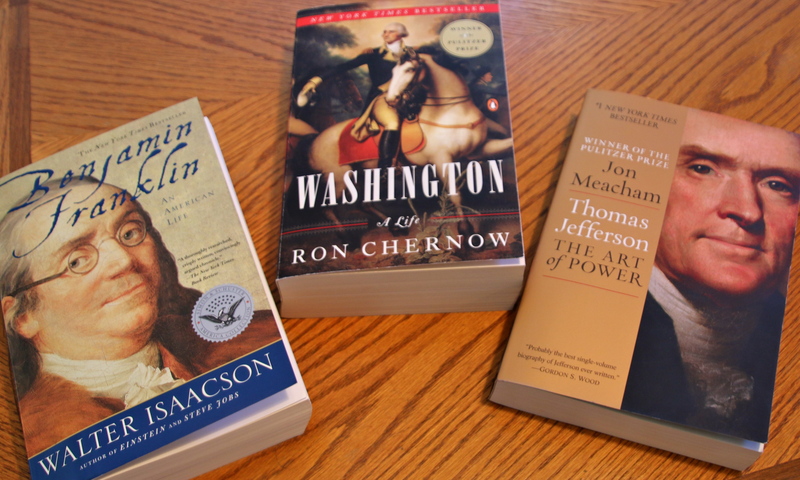 You’ve succeeded in turning Chernow, Isaacson and Meacham into a very enjoyable history lesson for the average reader. Using Tamara Culp’s comment, in this piece you’ve reclaimed history’s “invisible” grey and pronounced it sensible but missing in today’s continuous cacaphony of black and white. Enjoy your Wheat Thins and pajamas, but please keep writing. You are needed.. . I need my Dave Krieger fix more often than haphazardly. Keep up the superb writing — whatever the topic! Interesting read, Dave. We used to get treated to these types of insights and analysis, even on the mundane, every day when you were on KOA. Hopefully Greg Foster will read this and realize, yet again, how foolish he was to let you go. As an aside to Foster, the Susie Wargin Show is a pathetic giggle fest. I miss you. I miss smart discussions and smart commentary and folks who are not afraid to call things like they see them, whether I agree or not.